1. The room must be a place that invites relaxation, tranquility and restfulness. This means a muted, simple and cool color palette is a must: think grey, pale blue, lavender or pale green. 2. A bedroom should feel romantic. Things that evoke romance in a room? Curved lines, soft simple bedding and ethereal details like lace and glass. 3. Lastly, I always like to infuse a little bit of glamour. 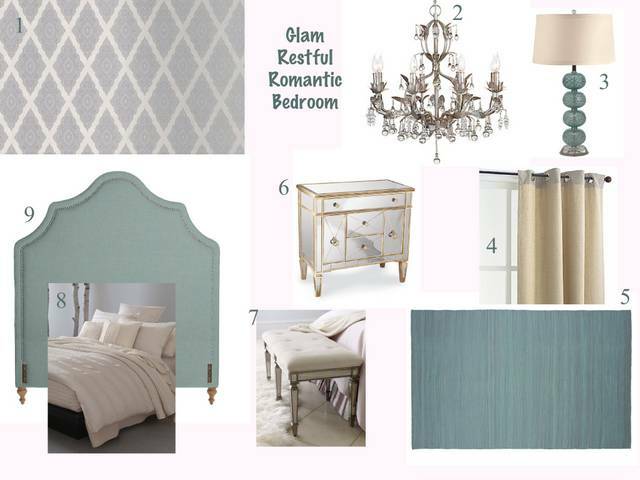 In a bedroom this means reflective surfaces, wallpaper and ALWAYS, ALWAYS a fabulous chandelier. 1. Lace-inspired wallpaper: Graham & Brown Jewel Wallpaper – 2modern, $85/roll; | 2. Chandelier: Bellina Chandelier in Platinum – Z Gallerie, $399; | 3. Mouthblown glass lamp: Lafayette 27″ Table Lamp – Home Decorators Collection, $249; | 4. Drapery panels: Ciudad Window Panel in sand – Pier 1 Imports, $32; | 5. Rug: Jaipur Rugs Capri Flat Weave – Gilt Home, $45-$399; | 6. Mirrored nightstand: Amelie Mirrored Nightstand – Horchow, $799 | 7. Bench: Denison Mirrored Bench – Horchow, $549 | 8. Bedding: Donna Karan City Strip Duvet – Gilt Home, $165-$215 | 9. Upholstered headboard: Pondicherry Headboard with Nailheads in Mist Linen – Serena & Lily, $1,250-$2,050.